New and stronger demands on reliability of used NDE/NDT procedures and methods have stimulated the development of simulation tools of NDT. A realistic mathematical model of the ultrasonic inspection situation makes it possible to avoid, or at least reduce, time-consuming and costly experimental work. It can also be useful in the design of inspection routines as it can give an estimate of whether a postulated defect can be detected or not. The present paper describes such a mathematical model and its contribution to this endeavour. The industrial application of ultrasonics in non-destructive testing and evaluation (NDT/NDE methods) offers the possibility to perform in-service inspection with the capability of detection, localisation and characterisation of flaws and other defects in the structure. Mathematical modelling of the ultrasonic NDT situation has become an emerging discipline with a broadening industrial interest in the recent decade. New and stronger demands on reliability of used procedures and methods applied in e.g. nuclear and pressure vessel industries have enforced this fact. To qualify the procedures, extensive experimental work on test blocks is normally required. A thorough validated model has the ability to be an alternative and a complement to the experimental work in order to reduce the extensive cost that is associated with the previous procedure. The most significant advantage of a computational fast and against experiments validated and verified model is its capacity in parametric studies and in the development of new testing procedures. To date only a couple of models have been developed that cover the whole testing procedure, i.e. they include the modelling of transmitting and receiving probes, the scattering by defects and the calibration. Chapman  employs geometrical theory of diffraction for some simple crack shapes and Schmitz et al  develops a type of finite integration technique for a two-dimensional treatment of various defect types. These models are compared with experiments within the PISC project by Lakestani . Overviews of the modelling of ultrasonic NDT are given by Gray et al  and Achenbach . The SUNDT program consists of a window based pre-processor and postprocessor together with a mathematical kernel (UTDefect) dealing with the actual mathematical modelling. The UTDefect computer code has been developed at the Division of Mechanics at Chalmers University of Technology and has been experimentally validated and verified. The software simulates the hole testing procedure with the contact probes (of arbitrary type, angle and size) acting in pulse-echo or tandem inspection situations. There is a broad variety of defect types included in the program and roughness and different spring boundary conditions on the crack surfaces can be added to some of the defects. This model employs various integral transforms and integral equation techniques to model probes and the scattering by defects. In this way the frequency and some geometry limitations of the geometrical theory of diffraction  are avoided, still without the computer requirements that would result from a volume discretization using the finite element method or the finite integration technique . To qualify the procedures extensive experimental work on test blocks is normally required. A thorough validated model has the ability to be an alternative and a complement to the experimental work in order to reduce the extensive cost that is associated with the previous procedures. In the present paper a simulation tool for ultrasonic NDT (SUNDT) is briefly described together with some exemplification's of its application in the qualification process. 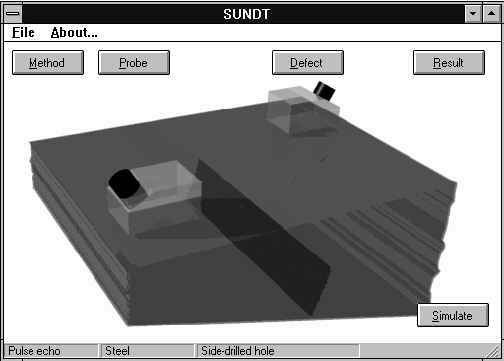 SUNDT - A Simulation tool for Ultrasonic NonDestructive Testing. Fig 3: Choice of method, calibration and material. Fig 4: Presentation of the result of the simulation as A-, B- and C-scans. The UTDefect software was originally created to meet demands from a limited group of scientists. Due to this fact the program was introduced with a rather austere pre-processor and the result was obtained as data-lists. In order to increase the number of possible users of UTDefect a project (SUNDT) was initialised to convert the UNIX-FORTRAN 77 based software into a modern PC version. In the Windows-based pre-processor (Figure 2) an input file to the computer program is created in a logical and lucid way. 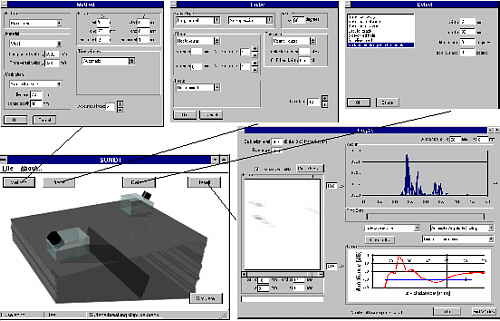 The user can choose between a number of settings as a starting-point for a specific simulation. Within the Method-window (Figure 3) adjustments of the number of used probes (pulse-echo, tandem or separate probes), material, measuring mesh and calibration can be done. In order to enable reduction of the computational time one can specify the time window of interest and adjust the accuracy index. When all the settings are made the executable UTDefect program can be started with a touch of a button.The pre-processor creates, after a check of some of the limitations of UTDefect, an input file and then the UTDefect program is executed. The post-processor (Figure 4) is made to simulate an environment well known by UT-personnel with the possibility to visualise the result of the simulation in A-, B- or C-scan representation. The C-scan is built up by the maximum response from each A-scan within the measuring mesh. To pick up a specific A- or B-scan, the user marks a point or a line in the C-scan picture. The graphs are all individually adjustable in order to implement a level representation and a layout, suitable for a variety of purposes. 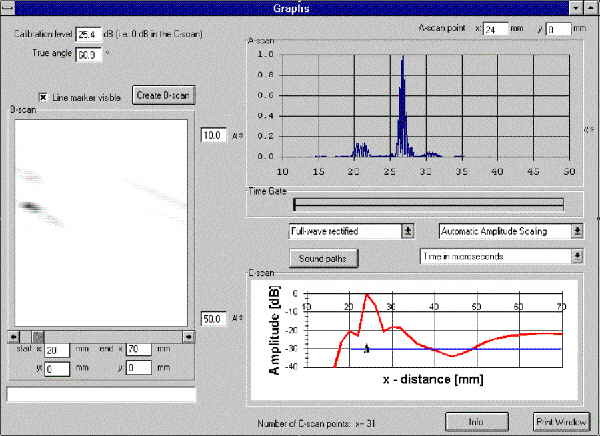 The computer program UTDefect has been developed to model some important situations in ultrasonic nondestructive testing of localised defects in an otherwise homogeneous and isotropic component. The probe is modelled by an assumed effective area beneath the probe used as boundary conditions in a half-space elastodynamic wave propagation problem. This enables an adaptation to a variety of realistic parameters related to the probe. Except specification of wave (longitudinal, transverse vertically polarised or transverse horizontally polarised shear waves) the angle of the probe can be arbitrary and the shape can be rectangular or elliptic. There is one parameter specifying contact conditions and another one giving the possibility to suppress the "wrong" mode type. Basically UTDefect only works with time harmonic methods so pulse problems are solved by superposing a number of frequencies. If maximum amplitude as function of probe position is of interest (C-scan), accurate result is often provided by information based on a single frequency. When time traces are needed both the centre frequency and the 6 dB bandwidth are sufficient information and the program assume a cosinesquare distribution of the spectrum. If more detailed information about a specific probes frequency spectrum is available, the program includes a more adaptable spectrum function. where at and ar are vectors describing the action of the transmitting and receiving probes, respectively, and T is the transition matrix of the defect. For other defects (surface-breaking cracks etc) a similar but more complicated structure is obtained. The quantities at and ar in Eq. (1) (and also the similar quantities for other defects) contain double integrals to be evaluated numerically. In order to reduce the computational effort, all these types of integrals that appear in UTDefect are calculated approximately by the stationary phase approximation. This approximation is valid if the distance between the probe and the defect is many wavelengths and if the defect is outside the probe's near field domain. In order to reduce this limitation and to include the opportunity to model focused probes, the effective area modelling the probe is divided by a number of rectangular probe elements. The total signal response is than obtained by superposing contributions from all these minor elements which reduces the near field length but increases the computational time required. The modelling of probes both as transmitters and receivers is discussed in detail by Boström and Wirdelius . The stationary phase approximation and its validity is also investigated. There are a number of defects of simple geometrical shape that can be chosen in UTDefect and most of them can also lie close to a planar back surface. Four volumetric defects are included: a spherical cavity, a sphere of a different elastic material, a spheroidal cavity, and a cylindrical cavity (SDH). Cracks are very important defects in practice and two crack shapes are thus included in UTDefect, namely the circular and strip-like (a crack larger than the ultrasonic beam width) cracks. The strip-like crack is assumed open, but the circular one may be open, fluid-filled or partly closed due to a compressive stress. All cracks are assumed to be perfectly smooth and planar except for the strip-like crack which inludes an option of surface roughness. All the defects except for the SDH may lie close to a planar back surface where the multiple scattering between the defect and the back surface is then taken into account. The strip-like crack may in addition be surface-breaking, a very important type of defect in practice. The defects may by arbitrarily tilted. The back surface is assumed parallel with the scanning surface except for the strip-like crack where the back surface may be tilted. If mathematical modelling is to be used as an effective tool in any part of the qualification process the validation of the software has to be extensive and well documented. Every software that has been and will be developed inevitable include a range of validity which has to be investigated before it can be applied as a simulation of the reality. Lakestani  reports on the comparison of three NDT simulation software with physical experiments on strip-like cracks, performed within the PISC III program. Two of the models used, are based on the geometrical theory of diffraction (GTD), i.e. the NDTAC and the Harwell TOFD software, and the third model is a boundary element method based model from the Kassel University. Results from the Lakestani report are compared with UTDefect in Boström  and Boström and Jansson . In these reports the UTDefect is also compared with experimental results originated from set ups where surface breaking strip-like vertical cracks are situated in tilted back-sides. Both EDM notches with curved profiles  and full width notches  are used in the comparison and the defects used in the Lakestani report were fabricated by diffusion bonding. Fig 5: A-scan analysis from the pulse-echo situation when the probe are positioned at x-coordinate 24. 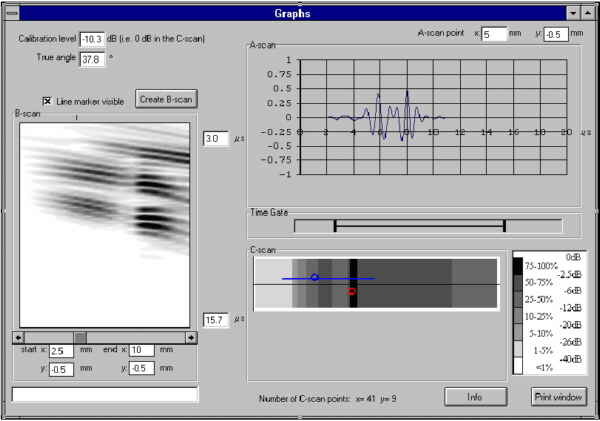 Fig 6: A-scan analysis from the pulse-echo situation when the probe are positioned at x-coordinate 64. Recently Eriksson et al  presented a validation of UTDefect using fabricated fatigue cracks (approximately shaped as parts of ellipses) in carbon steel plates. Both the corner echoes and the tip diffracted signals are used in the study and in general the simulations agree well with the experiments though the limitation of the former probe model, regarding defects in the nearfield, is perceptible. A thorough investigation of the probe and a comparison of the generated probe field with experimental data is also performed within the validation . The software has been applied as technical justification within the qualification of manual ultrasonic inspection procedure (UT-01) for in-service inspection of Swedish nuclear plants. The main object was to optimise angle, frequency and bandwidth of suggested probes and to justify range of acceptance of these parameters. The SUNDT software was also used to justify a reduction of test specimens since a number of defect related parameters were proven to be of insignificant importance in detectability sense. 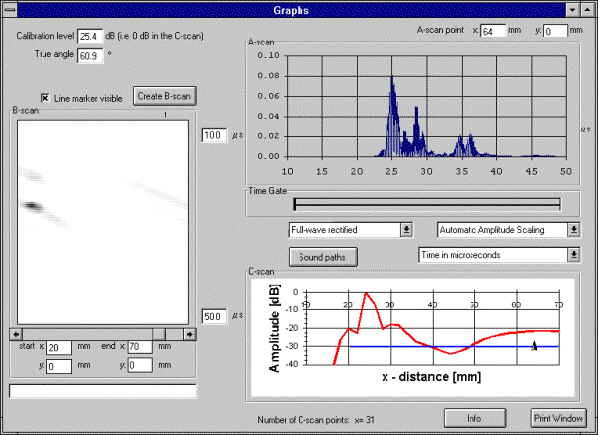 In order to increase the understanding of how the ultrasonic waves interact with the surface breaking strip-like crack a thorough investigation analysing the separate parts of the distance-amplitude curve (line C-scan) has been performed (Figures 5-6). The selected configuration was a 2 MHz 60° compressional probe with the crystal size of 8×14 mm, scanning the surface of the 36 mm object including a vertical 6 mm surface breaking strip-like crack. At the maximum amplitude position in the C-scan, 24 mm, the major contribution is probably due to the transversal wave hitting the surface at the critical angle which generates a longitudinal creeping wave, combined with the fact that above the critical angle the transversal wave is totally reflected. These don't separate in time at this position (both has the travelling time of 26.8 µs), which makes it difficult to single out the major contributor of the two, and could explain the distinct maximum peak in the distance-amplitude curve. When the probe is applied beyond about 45 mm in x-position the dominant part becomes the signal response from the generated longitudinal wave reflected at the corner as a longitudinal wave. As expected this signal response is maximum as the beam axis hits the corner of the crack (x-position 65 mm). Except for a minor part deducible as diffracted from the tip of the crack one can identify a number of parts that are visible in the A-scans in Figure 6. The from the transmitter generated longitudinal wave interacts with the crack, which generates a Rayleigh wave that travels at the surface of the crack and emits both longitudinal (26.4 µs) and transversal (36.3 µs) components as it reach the tip of the crack. This surface wave also travels back to the corner where a longitudinal component are generated (28.9 µs). It is also possible to identify a transversal component that has been generated as the longitudinal wave hits the corner (35.2 µs). The above is an analyse of the signal response provided by the model and the previous discussed validations does only include amplitude validations. Whether the above identified contributions are relevant or even being realistic to use in a sizing procedure is left to be validated in future investigations. The present work is sponsored by the Swedish Nuclear Power Inspectorate (SKI) and this is gratefully acknowledged. Chapman, R.K., J. Nondestr. Eval. 9, 127-211 (1990). Schmitz, V., Langenberg, K.J. and Krönig, M., "Modelling and visualization of ultrasonic testing sitution", Joint CEC OECD IAEA Specialists Meating on NDE, Petten, The Netherlands. March (1994). Lakestani, F., PISC III report No 16, Joint Research Centre, Institue of Advanced Materials, Petten, The Netherlands (1992). Gray, J.N., Gray, T.A., Nakagawa, N. and Thompson, R.B., in Metals Handbook 17 p. 202, ASM International, Metals Park, Ohio (1989). Achenbach, J.D., J. Sound Vibr. 159, 385-401 (1992). Boström, A. and Wirdelius, H., J. Acoust. Soc. Am. 97, 2836-2848 (1995). Boström, A., SKI Report 95:53, Stockholm (1995). Boström, A. and Jansson, P-Å., SKI Report 97:28, Stockholm (1997). Simonen, F.A., NURE/CR 1696, PNL-3469, U.S. Nuclear Regulatory Commission (1981). Chapman, R.K., private communication (1994). Eriksson, A.S., Boström, A. and Wirdelius, H., SKI Report 97:1, Stockholm (1997).